So. Another new year. What people should’ve done last year, what they should do, the quickness of it all, things on people’s minds. Mine too, of course, but for now I’d rather linger on the end of last year. A trip, a place far away in so many senses. I didn’t have my camera with me in Bangalore and for some reason I’m averse to phone photography so I have no photos this year. Which is a shame. Because India does visuals so well. The pastel paintbox houses, each a shade from coriander to peach, stacked so geometrically. The saris drying on clothes lines, silver pots and pans heating up in the sun, dogs panting in the shade, motorbikes and rickshaws idling. The ladies with jasmine woven into their dark braids; carrying chubby infants in expert hands, cows with flower garlands wrapped loosely around their horns, hand-painted trucks and tractors. In a small road in the village, teenagers chat. The cool boys on their motorbike with their snazzy collared shirts and slicked back hair doubtlessly inspired by a Bollywood hero. A girl carrying a puppy, the center of attention. Two old timers sitting on an iron balcony, presiding over it all, reminiscing. Heavy and rising afternoon heat. Inside the gated compound everything has grown. The tropical pines are thick and towering, the palms proud and facades of houses freshly whitewashed. Trees are dripping hibiscus onto the luscious lawns where nannies supervise the toddlers. There are cats prowling the boundary fences, the toms brawling in the evening as prayer bells ring and the smell of roasting spices floats out of every kitchen. It is early morning. Airless and sultry, the day’s heat building after it barely subsided. Like so many things in India, winter’s changing. I’m out running, soon I’ll be joined by other neighbors, racing a tropical sun . There’s a gentle glow from street lamps where moths gather, a faraway crane is lit for the holidays, clouds hurry past the waning moon. There’s another person out, a grandfather. It’s more than 20 degrees but he’s wearing a white scarf wrapped over his head and face, cotton like his billowing shirt. He regards the morning suspiciously, seeing the high rises all around us like he was hemmed in, a look of passive disdain on his weathered face. Maybe he was thinking about the vastness of home, the untameable north of the subcontinent. Miles away, a lifetime away. To him the year passing would be an inevitability, a grain of sand in the desert, or one of the thousands of stars that crowd the sky above it. It seems we’re starting the year with sherbet. It is in a sense like a sorbet since it’s a frozen fruity thing (often citrus) but has dairy to make it smooth and creamy which sorbet doesn’t. You could also call this recipe frozen yogurt but I thought sherbet sounded nice. Anyway it’s a very simple recipe and if you don’t have an ice cream maker you could make cute yogurt pops instead. You can adjust the amount of cardamom according to your taste but if you leave it out altogether you might want to add some vanilla instead. It’s also kind of healthy so if you ever wanted ice cream for breakfast… like Drake said, you can’t drink all day if you don’t start in the morning. Put all ingredients into a blender and blend to combine. Pour into ice cream maker and churn according to ice cream maker’s instructions. 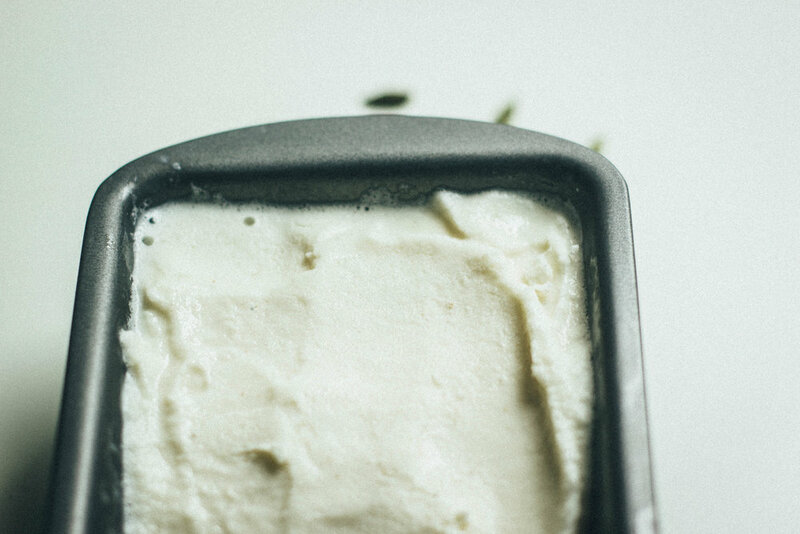 Make sure you freeze the bowl-part of your ice cream maker in advance (it varies but often 24 hours before churning). 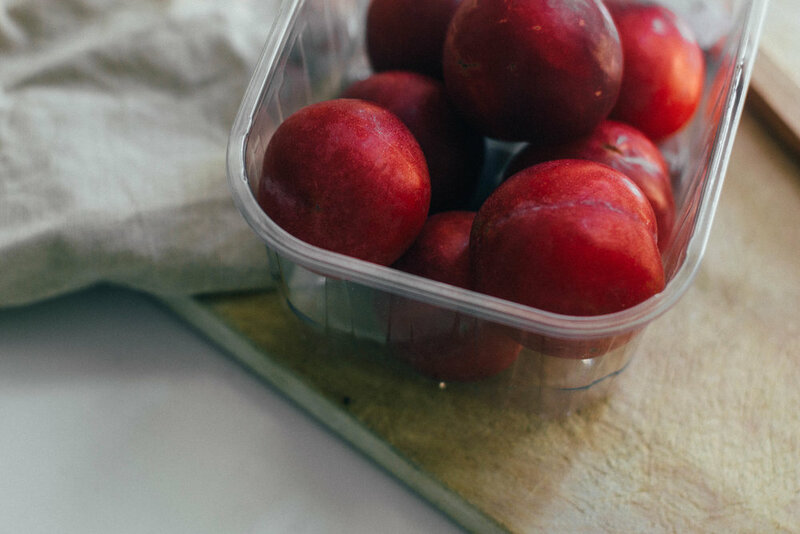 Make sure you use a freezer friendly container to let your almost-sherbet finish freezing. It will keep for a long time. It may help to take the sherbet container out of the freezer a few minutes before serving so it’s less icy and easier to scoop. After reading my last post my mum made a comment about the quote at the end. I was pretty happy that someone knew the poet and that, well, someone noticed it. I started adding a quote at the end of each post a while ago - they're not all quotes I guess, since Alan Walker or Kendrick Lamar don't really count. But whatever. I put somebody else's words at the foot of the page, after my ramblings, to conclude. I'm not sure what you think of them? Maybe they come across as unnecessary but I just never really know how to finish a post... to awkwardly shift gears from some abstract mumbling to a foodie discussion. Somebody else's words seemed final enough without me having to spin out a yarn... because these posts are thoughts and thoughts don't particularly just, terminate. Or at least mine don't. I always used to have this issue with creative writing at school that I couldn't stay within the word limit. Too much to say, I guess, I'd have eaten up the word count and then would need to finish the damn thing in 100 words and that's difficult. A chronic fault of mine, saying too much. Using 550 words to say something that could probably use two. Funny that I don't talk a lot, in fact my sister said the other day that I seem to use the least words possible to communicate which made me laugh, internally, thinking of that little blue box in the lower right corner of a word document. But I digress. Quotes. I've been collecting lines from poems, songs, books, just browsing the internet, for quite some time. If I was a different kind of person they'd probably live in a leather bound notebook but honestly they're all in my email inbox. In a long email with a hundred one line replies. Very cryptic. Very eclectic. I have a collection of journals from when I used to write every day; it's been a while since I've done that but there was time when I did, religiously. I flick through and there's a striking lack of endings. I seem to just cut myself off abruptly or there's a few lines blank, at the foot of the page. Maybe I was thinking of coming back later with some words to tie it all up but you know how it goes. Lines left blank, thoughts unfinished. Don't they say the only way to become a better writer is to write more? A fallacy, clearly, because I've got a box worth of scribblings without endings. Maybe I'll make that a project for one day, in the future. Sit out on a porch somewhere with that box and fill in the blank lines, all those loose ends. Then seal the box, and put it high on a shelf, or wherever it is you put memories. Awkward gear shift to popsicles is now initiated. I know it's getting colder - I was wearing a sweater, a sweatshirt and socks the other morning but the sun's still sharp up north where we are. 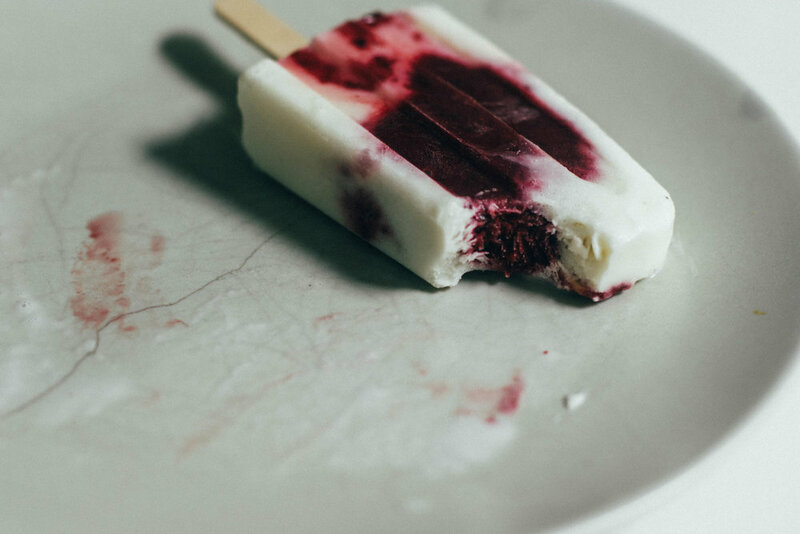 So make popsicles while the sun shines, with a bit of fall warmth from the cardamom and maple. Plums and blackberries are like those crossover fruits so they were sort of of the obvious choice. Have fun with the layering, I'm not exactly super careful/fiddly but the marbled effect was still gorgeous - the fruit will make the pops pretty, whatever you do. Start with the roasted fruit - you can even do this in advance. Preheat the oven to 180'C, 350'F and line a rimmed baking tray with parchment paper. 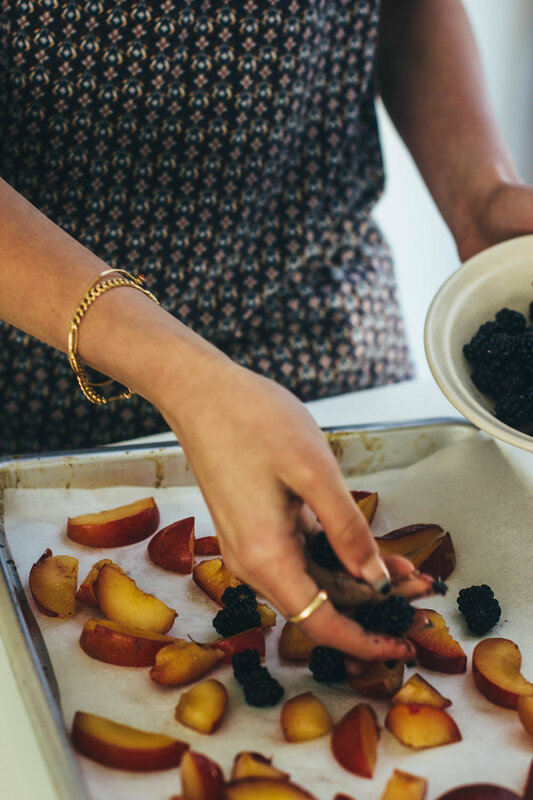 Gently rinse and dry the berries, chop the plums into chunks and spread out on the baking sheet. Sprinkle over the sugar and toss to coat. Roast for 20 minutes or so, until the fruit is collapsing and smells pretty amazing. Leave to cool, then refrigerate, or continue with recipe. Rinse out the blender and add your fruit. 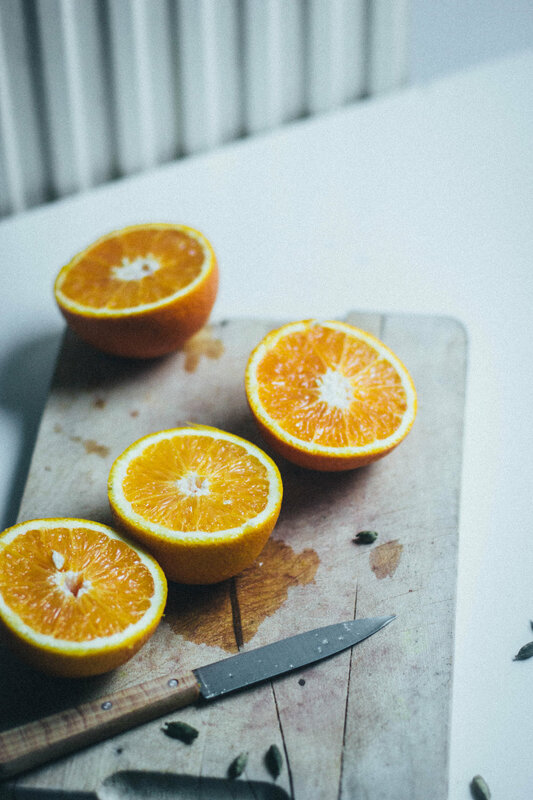 Blend until pulpy and a little liquidy, it doesn't have to be perfectly smooth. Into your popsicle moulds pour in some of the yogurt mix - I did about 1/3 but it really doesn't matter, whatever you think looks pretty. Dollop some of the fruit mix (heaped tablespoon or so) over the yogurt, then pour in more yogurt so the mold is more or less full. Freeze for 3-6 hours, until solid. If you wrap each individual popsicle they'll keep in the freezer as long as you like. You can run the whole moulds under hot water if the pops are giving you a hard time; they'll release super easily. If you have any leftover blended fruit, you can swirl it into yogurt, oatmeal etc a bit like jam. *This is the popsicle mould I use, I ordered it from the States and it's really good. Lots of people say that roses remind them of their mothers, and they do for me too. We used to have a few hours wait between when our flight from Heathrow arrived in Bangkok and our connection to where we lived in Malaysia. We'd wander around the glossy airport; my mum, my sister and I, looking at all the expensive stores, trying on pointless perfumes and reading the back of books. The place we'd always visit was the natural skincare store L'Occitane for their rose hand cream. Papery skin, after a long flight, the prospect of a couple of months in dry heat, that floral scent was always like a throwback to springtime europe. We'd buy a small bottle each, and go to the foodcourt, where each stallholder was still dozy and the European backpackers slept on their gear. Mum always ended up wearing that same black sweater to travel - our dad and us had tried dozens of times to find something similar, but always failed. Too brown, too formal, too thin, and she was happy with that same one anyway. We had roses in our house in Belgium. That was my first time with a rosebush of my own. The garden in that house was crazy - it was divided by shrubs and hedges into small sections, each with their own character. It was sloping, everywhere, which made it hard to mow the lawn and the grass was often left long in some areas, so they looked like meadows. We all did a lot of work in that garden, my dad did the patio himself one summer, and my sister and I would rake up after he'd trimmed the hedges, and we built a little run for Prune, with chicken wire, just after we got her. My mum's place was the spot by the back door in the kitchen, on cold fall days when we'd be out tidying leaves, she'd be there, watching out of the window and waving. Too many trees, she used to say. They make the garden dark and wet, and when the leaves fall it's a mess. She joked that we should cut all the trees but leave the rosebush, where it was, frail but thorny, standing out on the patio. Standing out through summer storms, autumn winds, bitter winter frost, but unfailingly blooming bright in late spring. It reminded me of her. On Mother's Day and for her birthdays we've always bought her flowers. Apparently my dad has always done it, since Layla and I were very young, and I remember he'd often arrive home, late evening from London with a bouquet of flowers. Just like that, a surprise. They'd grace our dining table in some mishappen vase or the other, whatever we could find. He started to travel more, the flowers appeared less, my sister and I would organise them when he asked. Somehow Layla or I would scrounge a bouquet from somewhere - carrying the battered blooms back on buses, I'd take them to the last lesson of the day with me because they didn't fit in my locker. My friends would ask, why the flowers? I'd remind them it was Mother's Day on Sunday and they'd just give me funny looks, but I knew that the flowers would soon be in the skinny vase on the kitchen window sill. My mum likes them, any kind, she says they add something to the house. A little beauty every day, makes things brighter, or words to that effect. They enliven our kitchen for a few days and after they're gone, the sill suddenly seems very cold and empty. Mothers are like that too. Like the bouquets of flowers we buy them. Quietly resilient, cheerfully defiant. Even with the best intentions, we put them through hell. She wants the best for us and we'll pick off the petals. None of us notice that they're wilting until the water in the vase is almost empty and we'll do everything we can to revive them - fresh water, a spot in the sunshine. They bring so much to the house, they are the very heart of it. We know the bouquets will never be enough. But we buy them, as we always have, to see her pretend that she had no idea it was Mother's Day and that we'd been arranging flowers, and she'll open yet another card and put it in the kitchen drawer, we just need to feel like we've tried. There's no real way to show our gratitude. But there's something nice about watching her standing by the window sill on which the vase sits, cradling her mug of coffee in her hands, looking out at the first few buds on the cherry tree. So I'm back, with more frozen/creamy goodness in time for Mother's Day (Sunday in the UK). I know I made something similar recently but you may now be aware of the fact that my mum shares my passion for coconut? Mango is her other favourite fruit... and mango and coconut are so great together, as you probably know from some tacky beach resort somewhere. Also my mum has been on this health kick thing recently (she's taken up running!!! I am quite proud) and I didn't want to sabotage that by bringing out some cake, did I? dessert ain't no fun if mum can't have none. Anyway, for Morher's Day, I present you the easiest recipe on this site, with the smallest ingredient list, ironic considering all I just said about mothers but hey sometimes the simplest things are best, and I'm sure they'll agree. Mine would 100% stand by that. 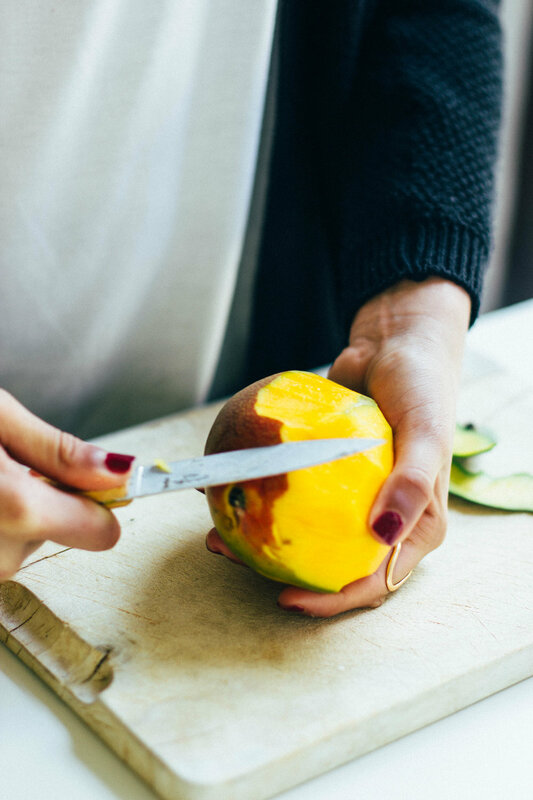 Prepare your mangoes - peel the skin and remove the flesh from the stone. You probably know how to do it better than I do. Chop the flesh into chunks and set aside. Pour the coconut milk from the can into the jug of a blender. Split and scrape in the seeds of the vanilla bean, add the ginger if you wish, and the maple syrup, then the mango chunks. Blend on high till smooth and sunshine yellow. 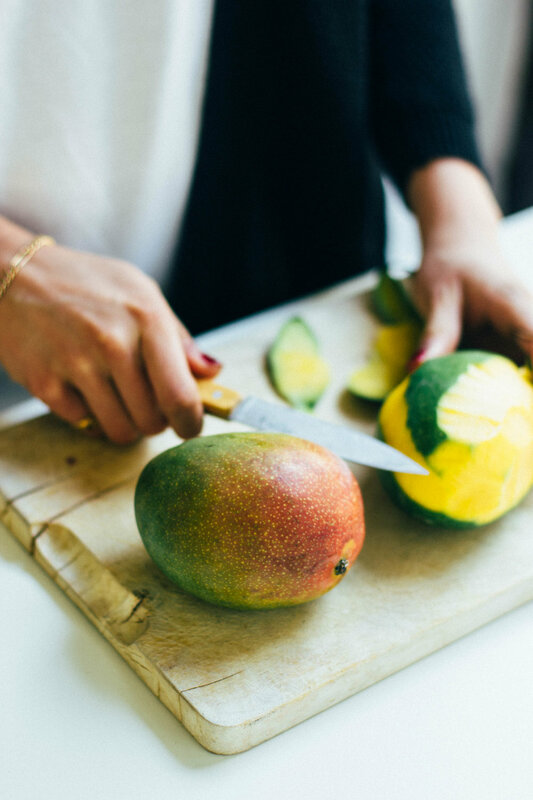 I have a crazy strong blender so this took all of 5 seconds, but if yours is less so, just keep blending till there are no more chunks of mango. 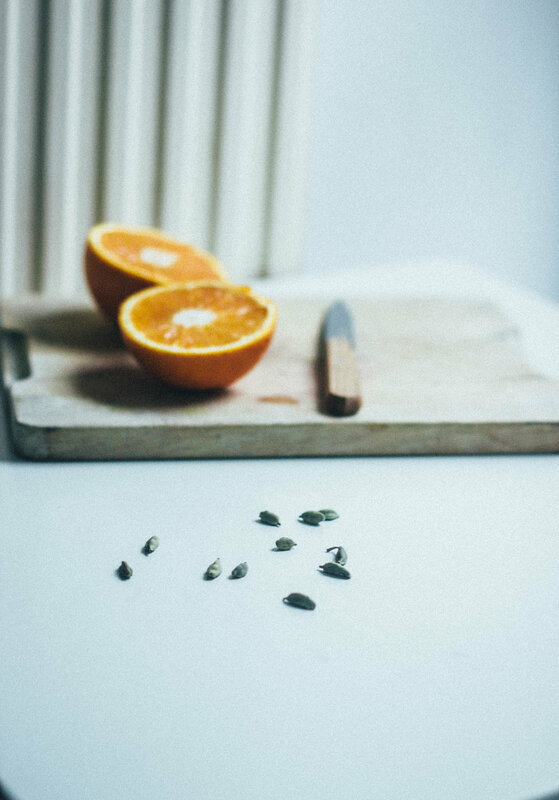 Taste and check sweetness - it dulls once frozen, so keep it sweeter than you'd like. Once totally cool (totally cool) , pour the liquid into the bowl of your ice cream maker and churn according to manufacturer's instructions. Pour into a freezer proof container and freeze till firm if you'd like, otherwise you can serve the ice cream straight away. You may need to let it sit out for 10 minutes before scooping if it's been in the freezer. 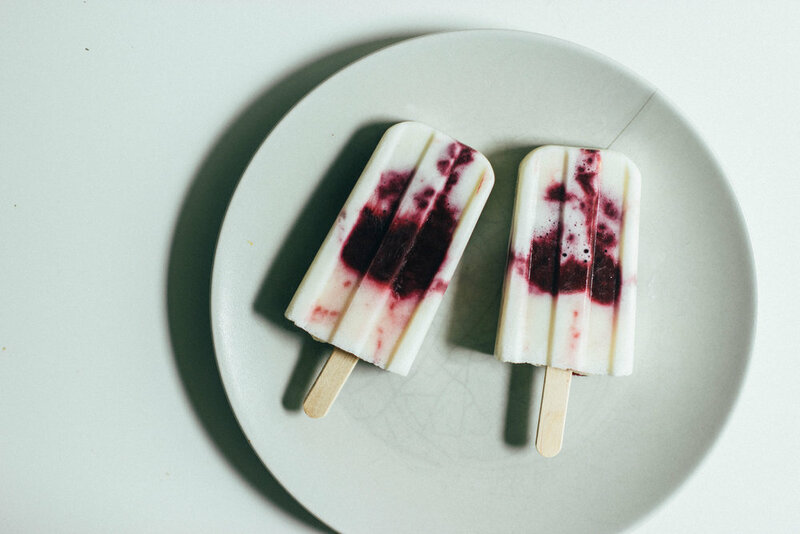 If you don't have an ice cream maker, feel free to make popsicles. Or a slushie-shake type thing.